CITY folks who are into watersports such as jet-skiing, wind-surfing and even waterskiing would have known about Tasik Biru or Blue Lake in Kundang. 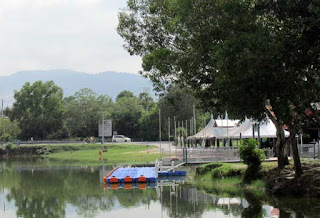 It's 20 minutes' drive from the city centre of Kuala Lumpur via the Latar highway, which connects Gombak to Kuala Selangor. Although the lake lies in the district of Kuang, it is more well known as the Kundang lake. In the mid-1990s, jet skiers and windsurfers would descend upon this lake to go for a spin, raising the ire of local anglers. Frequently, there would be an exchange of words as each justified their presence. I remember also the tales being circulated about giant snakeheads said to have attacked people. One famous story was about a 1.5m giant snakehead which bit a chunk of flesh off a jet skier's buttocks when he fell into the lake. There had also been stories of arapaimas spotted swimming in the lake, but no one had actually captured photographic evidence of any. I often wondered if the tales had been concocted by anglers to drive away the jet skiers and windsurfers so that they could enjoy fishing in peace. According to local knowledge, this lake was a disused tin mine, abandoned in the late 1950s. Back then, because the depths had yet to be overgrown with vegetation, the crystal-clear waters and sandy white bottom reflected the blue skies on cloudless days. This was how the 20ha lake probably got its name. Another source stated that a palong was used to mine tin here. In this mining method, a strong jet of water is shot at the side of the quarry to loosen the tin-rich soil into slurry which is then sucked up the top of the palong and allowed to run down troughs equipped with riffles. These riffles trap the heavier tin ore and at the end of each day, miners would shovel the ore into heavy canvas bags. The tin tailings, sand and slime were dumped at the other end of the quarry. 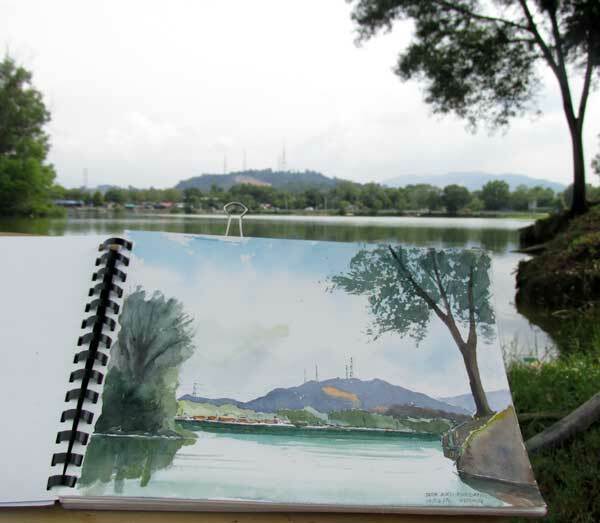 The island on the southeast end of Tasik Biru, where I was painting, was believed to be the mound of this mining waste. Apparently, some years back, one could just wade through the waist-high water to get to the island. However, when I was there, I saw that the water was too deep to take that suggestion seriously. The island was apparently one of the locations where the Malay movie Merah, starring Ziana Zain, Awie and M. Nasir, was shot in the 1990s. It is not known how deep the lake is, but an angler who was fishing nearby estimated it to be about 30m at the deepest part. He cautioned anyone against swimming in the lake unsupervised because of the many lives that had been lost in its depths. In fact, a newspaper cutting recorded 34 deaths over the years due to accidents in the lake. The day I was painting at the lake, I saw local council workers sprucing up the banks on the east end. A lakeside restaurant, with a beautiful view of the lake, is a recent addition. It was as a result of the refurbishment of what used to be an underused pavilion for watersports activity built by the council. Today, the restaurant attracts locals as well as travellers passing through Kuang in the evenings, to enjoy a meal while taking in the tranquillity of nature. 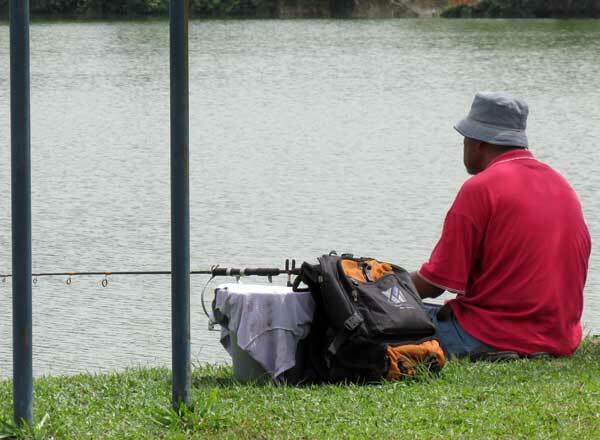 Kundang is synonymous with freshwater fishing and has been an anglers' haven since the 1990s when they find their bounties of snakeheads (ikan haruan) and tilapias in several disused mining ponds in this area. There were also some commercially operated fishing ponds here that have gained a loyal following. One of these ponds is located just beside the Latar Highway, adjacent to the Kundang Lakes Golf Course. Known as Tow Foo Sportsfishing, this was one of the earliest commercially operated ponds with an emphasis on fish conservation with its practice of catch and release, as well as lure fishing using artificial baits like spinners and poppers. This fishing pond is still operating after so many years. There is also another fishing pond just beside the road not far from the Blue Lake. No nails are used in traditional houses like this one, only wooden pegs. MY attention was drawn to this traditional house by the sparkle of sunlight caught on its orange-coloured roof tiles when I visited the Forest Research Institute of Malaysia (FRIM) in Kepong. I used to see these tiles, called atap genting singgora (singgora clay tiles), in my home state of Terengganu when I was a child. The morning sun had cast long shadows on the subject, as if calling for it to be painted, and I obliged. the lichen building up under it? According to a faded information board at the staircase, this traditional Terengganu Malay house originated from Pulau Rusa in Terengganu. When it was dismantled and brought to FRIM in 1987 to be reassembled, it was believed to be already over a century old. It was bought from the original owner for about RM1,500, according to another source. Made of cengal wood (Neobalanocarpus heimii), this house belonged to the Rumah Tiang Dua-Belas category in which the main structure is supported by 12 timber posts (tiang). Save for a few broken roof tiles, the house still looked quite sturdy. I would have gone in to check it out had I not spotted a pack of wild dogs which sought refuge inside. A friend of mine told me that this type of house is also known as Rumah Bujang Berselasar, the Terengganu traditional Malay house in its simplest form — with only two areas: the main house area (rumah ibu) and the verandah (selasar or serambi), connected by a small staircase. Guests are usually received at the verandah, which also serves as a place to relax on a hot day or carry out chores such as making handicraft or teaching children to read during the day. The roof tiles used in this house are said to be similar to the atap singgora used in Thailand. 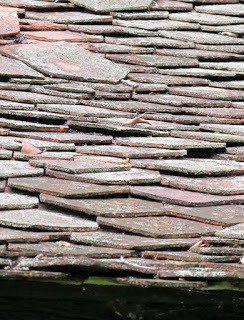 In fact, the term Singgora refers to a place in old Thailand where roofs are tiled using these. Each tile comes in a long pentagonal shape, with a hooked end on one side. They are made by using the foot, dried in the hot sun, and then fired in a kiln. I believe these tiles are still being made in some remote villages in Kelantan. To install them on the roof, each tile is hooked onto the rafter and arranged side by side. Each ascending row of tiles sits on top of another on the lower rafter. Each piece is placed to overlap, top over bottom, so as to cover the gaps to prevent rainwater from seeping through. Singgora tiles are very brittle. Roof-tilers had to be extremely careful of their steps when mounting these tiles on the rafters as they cannot hold the weight of a person. The Singgora tiles are also lighter and porous, and they absorb moisture during the night. During the day, the moist tiles are able to keep the house cool. 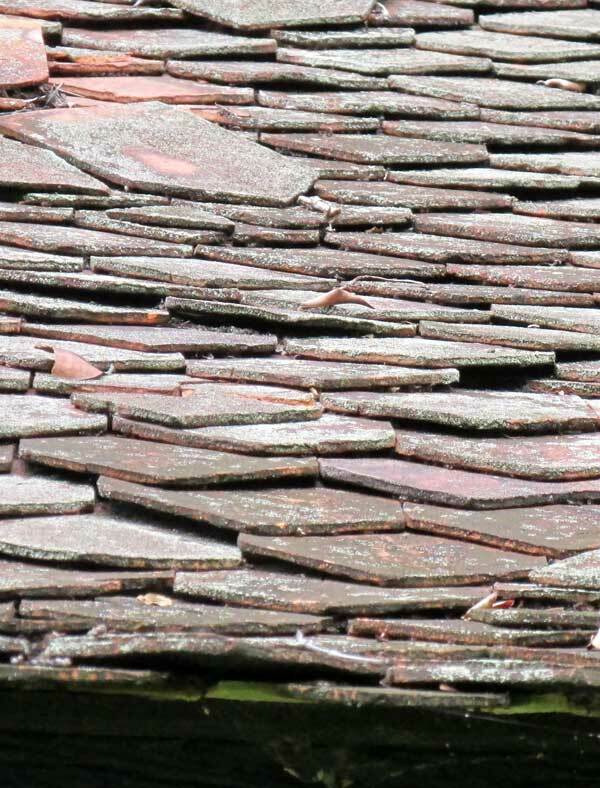 Usually, moss will grow on them and add to the cooling property of roofs using these tiles. Of course, for the occupants, the interior of such houses can sometimes be quite damp, especially during wet spells. Like most traditional Malay houses in Terengganu and the east coast of the peninsula, the timber posts of this house stand on stone piers. The high posts keep pests like ants and snakes from entering the house and the structure free from flood waters. The space beneath the house allows further cooling of the structure. This area is often fully used for storage, sometimes to rear poultry, or even to air-dry clothes during rainy seasons. 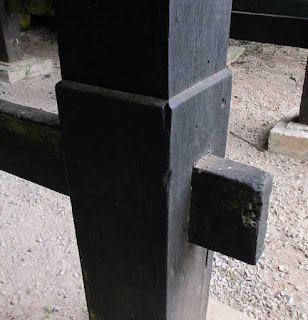 The stone piers on which the posts stand prevent dampness from seeping into the wood. They also serve to deter termite attacks. In case of an attempted attack, the termite mud-tubes (trails left by the insect whenever travelling through exposed surface) would have been spotted first before damage is done. CLAY obtained from the river is first processed to the right consistency. It is then slapped onto a slanting wooden mould shaped like a longish pentagon and compressed by using the feet. The depth of the mould gives the tile its thickness. Excess clay is removed by dragging a bow with a wire across the face of the mould. 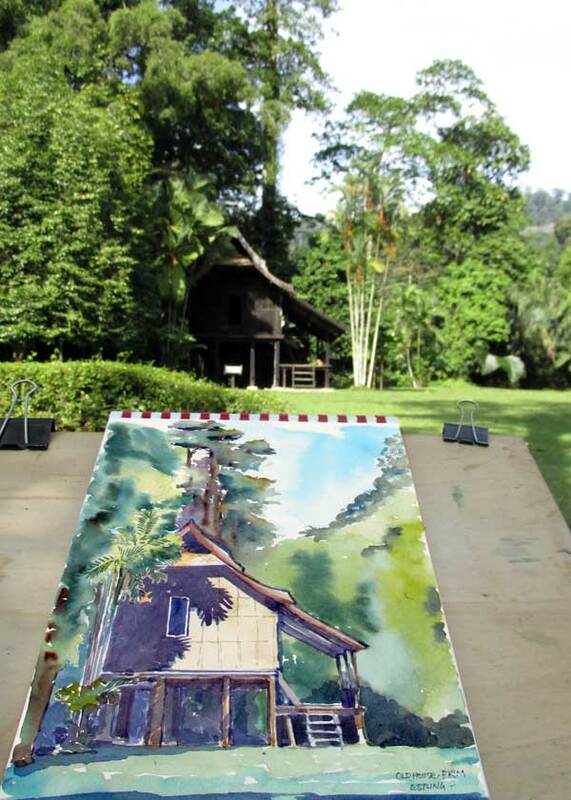 The Singgora clay roof tiles are believed to be similar to those use by Thai traditional architecture. They are porous and can absorb moisture and cool the house down during the day. The soft sheet of tile, like plasticine in texture, is then peeled off from the mould and arranged side-by-side on an open ground to be dried under the sun. Here, the hooked end is folded manually, using a small block of wood as a guide to ensure a uniform height. Once the tiles are sufficiently dried, they are then fired in a kiln, turning their colour from grey to orange-red. 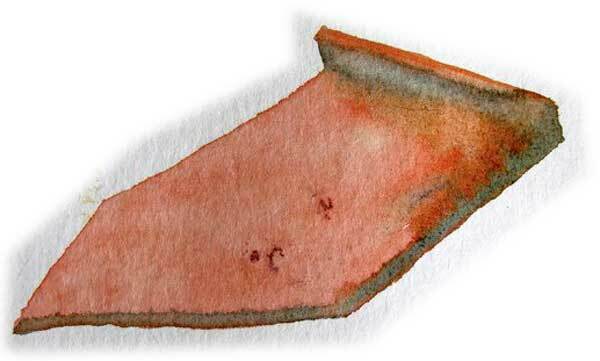 This is the writer’s impression of a single piece of Singgora clay tile turned upside down. The hooked end is folded at right angles so that it can clasp onto the rafter when put in place.